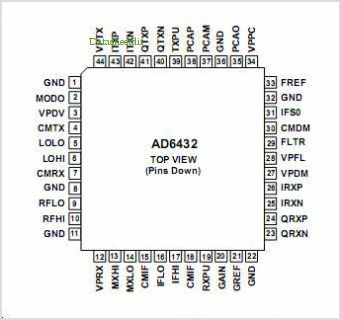 The AD6432 IF IC provides the complete transmit and receive IF signal processing, including I/Q modulation and demodula- tion, necessary to implement a digital Wireless transceiver such as a GSM handset. The AD6432 may also be used for other Wireless TDMA standards using I/Q modulation. The AD6432s receive signal path is based on the proven archi- tecture of the AD607 and the AD6459. It consists of a mixer, gain-controlled Amplifiers integrated roofing Filter and I/Q Demodulators based on a PLL The low noise, high-intercept variable-gain mixer is a doubly-balanced Gilbert-cell type. It has a nominal 13 dBm input-referred 1 dB compression point and a 0 dBm input-referred third-order intercept. The gain-control input accepts an external control voltage input from an external AGC detector or a DAC It provides an 80 dB gain range with 27.5 mV/dB gain scaling, where the mixer and the IF gains vary together. The I and Q Demodulators provide inphase and quadrature baseband outputs to Interface with Analog Devices AD7015 and AD6421 (GSM, DCS1800, PCS1900) baseband convert- ers. An onboard quadrature VCO externally phase-locked to the IF signal, drives the I and Q Demodulators The quadrature phase-locked Oscillator (QPLO) requires no external compo- nents for frequency control or quadrature generation, and de- modulates signals at standard GSM system IFs of 13 MHz, or 26 MHz with a reference input frequency of 13 MHz; or, in general, 1X or 2X the reference frequency. Maximum reference frequency is 25 MHz. By Analog Devices, Inc. This is one package pinout of AD6432,If you need more pinouts please download AD6432's pdf datasheet. 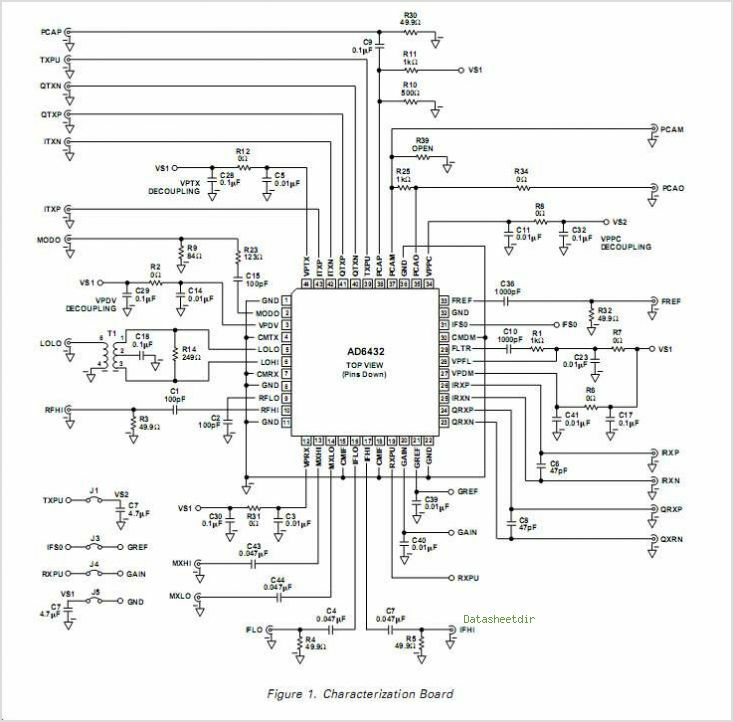 This is one application circuit of AD6432,If you need more circuits,please download AD6432's pdf datasheet.